The Ayrshire property market remains very active, with the market for countryside properties with land up to the 450,000 price bracket being very strong with supply outstripping demand. The firm has published its latest statistics for the first quarter of 2018 (Jan March), with viewings remaining healthy and double the number of market appraisals being carried out over this quarter in comparison to the last quarter of 2017. The higher end of the Ayrshire property market is improving as a result of more English buyers choosing to relocate and having the equity to buy in the 450,000 plus market where property offers fantastic value for money. 33% of house sales were to buyers from the UK outwith Scotland who acknowledge the affordability on offer in Ayrshire, the remaining 67% were Scottish buyers, of which the majority were buyers from within the local Ayrshire market. The affordability of property in Ayr, and its accessibility to large towns and the central belt, still presents a great lifestyle choice for those looking to get a sizable property and nice garden. However, as a result, there remains a shortage of properties up to the 400,000 price bracket. We are now very much in the prime Spring selling period and have witnessed a surge in activity with one attractive country house for sale in the higher end of the market attracting 19 viewings over last four weeks and expect this level of activity to continue. Our sophisticated marketing data base of buyers and sellers has allowed the firm to actively match prospective buyers to new property registrations. A quarter of buyers of property for sale through the Ayr office are people registered with Galbraith. Across Scotland as a whole, Galbraith handled over 40 million worth of property sales over the past quarter alone (Jan March 2018). Overton Farm is a handsome B-listed farmhouse well located by Kilmaurs (2.5 miles) and easily accessible from Glasgow and the Ayrshire. Built in 1805, Overton Farm is a handsome Georgian house which has been renovated to a high standard by the current owners. 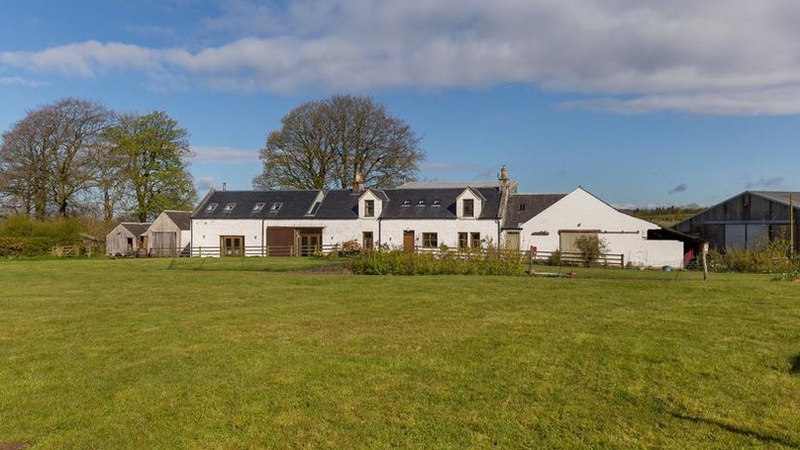 The property is set within 12.28 acres of grounds, with 10.6 acres grazing land presently divided into a number of paddocks and there are additional stone buildings providing useful storage including a large workshop, games room, sauna and stores. This sale also presents a business opportunity as part of the farm buildings have been developed into a charming coffee shop, The Toffee Coo Tearoom', and a small Garden Centre. Bogend Farm, which extends to approximately 64.7 acres, with grazing land and some mixed amenity woodland, offers an excellent opportunity for those looking to purchase a small farm or those with keen equestrian interests. The original farmhouse has been extended to create an impressive country house of luxury accommodation, sympathetically restored and improved by the current owners. There are also a number of useful out buildings including a large Dutch barn, cubicle house and former milking shed and byre, a four-car garage, detached garage, former stables and store.